Keen is a relatively new shoe company on the market. They were founded in 2005 by Martin Keen in Rhode Island, but quickly moved their headquarters to Portland, Oregon in 2006. Since then, they have captured the attention of workers and hikers across the world for their boots, sandals, and other footwear primarily built for outdoor activities. They’ve also expanded their product line outside of just footwear, now making bags, socks, and other clothing items. They are still based in Portland today, but are they still manufacturing and sourcing all of their products in America? We investigated to find out. Our verdict is below. Verdict: Are Keens Made in the USA? Some of Keen’s footwear products are assembled in the USA out of their Portland factory, but several materials for those products come from Asia and other parts of the world. Keen opened up a plant in North Portland in 2010 to return some manufacturing to the United States, which is definitely a good start. Everything coming out of that factory is tagged as “American Built”, which you explore on their website here. However, they still get materials for the entire upper (everything above the sole) from various countries in Asia, so they are not sourcing domestically. 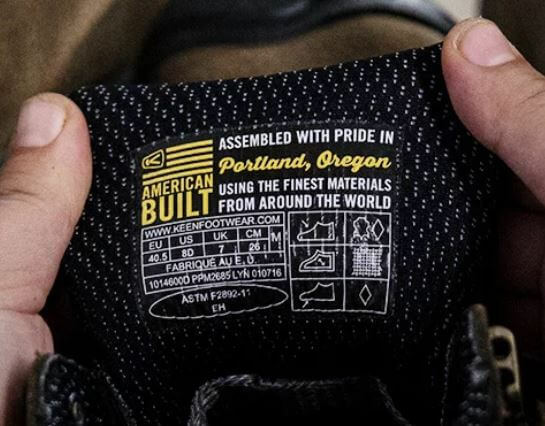 All of their American Built products have a tag on the inside lip to distinguish them (pictured below), with the phrase “Assembled with pride in Portland, Oregon using the finest materials from around the world.” This language is used pretty commonly for brands who are wanting to promote their American factories but still source their materials globally. It’s important to point out that Keen’s “American Built” series is still only a fraction of the total amount of footwear and other products they produce. In their online store today, Keen has 20 total American Built styles, compared to 312 styles total across all of their footwear collections (99 women’s, 142 men’s, 71 kid’s). That is only 6.4% of their total footwear styles, and that doesn’t even count the other non-footwear products that they are producing now. Our hope is that they bring even more manufacturing back to the United States and also start sourcing some of their materials locally. In the meantime, if you’re looking for alternatives check out our guides on the best work boots, sneakers, sandals, and general footwear.